Avocado Oil is the liquid pressed from the soft green flesh around the pit of the avocado (a.k.a. Persea americana). Avocado oil benefits are vast, and not limited to the fact that you can use it for cooking. It is an excellent emollient and considered a highly penetrating oil which contains natural Vitamins A and E which work synergistically to improve the skin texture. The impressive nutritional profile of our Avocado oil makes it an ideal ingredient for inclusion in skin care recipes intended for dry, dehydrated and mature skin. Its notable content of unsaturated fatty and essential fatty acids also makes it ideal for inclusion in nourishing, moisturizing hair care formulations. - Great for body, face, skin & hair. 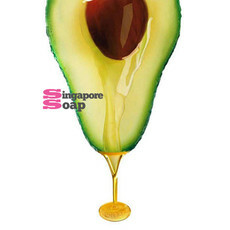 Avocado oil is of great importance to the cosmetic industry in that it contains a plant sterol called phytosterol which has the same penetrating abilities as lanolin. This particular quality of avocado oil as reported by the Naarden Newsletter, Oct 1958, make it eminently suitable for skin and massage creams, massage oils and all other preparations which are used for applying to, or rubbing into the skin. The ability to penetrate the skin is no doubt the key to the success of avocado oil as a natural and effective beauty aid. The quality of the oil makes it ideal as a carrier for other substances which are not capable of their own accord to permeate into the skin. Avocado oil exhibits excellent penetrating qualities making it ideal as a massage oil or carrier oil for treatment products. It is moisturizing while having a low chance of clogging skin pores. Our Avocado Oil are all natural and expeller pressed. Freshmart is a Singapore company that specializes in the import, export and distribution of premium quality fresh fruits and vegetables. Importer, exporter and distributor of canned fruits and vegetables. Bengawan Solo Web Admin ... Our in-house specialities speaks for itself. A wide range of variaties that looks and taste this good can't possibly go wrong. Good beer must always be paired with excellent food, for the most pleasurable dining experience. Key in coupon code "FS150" to enjoy free shipping for purchase over SGD150.00MINI DONUT PEACH/SPAIN/.. REGION OF THE MONTH: NORTH JAPAN (NIIGATA) Follow JAPAN RAIL CAFE's Facebook page for more information on the upcoming events! FREE DELIVERY to your nearest store, or your doorstep with min order of $80! Zaroob, literally translates to "small alley". It is a concept which was inspired by the traditional street food vendors found around the Levant region. PurelyFresh® is the one stop portal to buy online grocery in singapore, We cover all major areas and Deliver Singapore online Grocery Shopping services.